Sew Dixie Lou. : As Robert Smith says, HOT HOT HOT! As Robert Smith says, HOT HOT HOT! I've got a couple of items to blog but hangovers, rain and bad hair have all delayed any good photo opportunities there is. But be patient my dears, my bum-bum will be gracing your screens in no time. 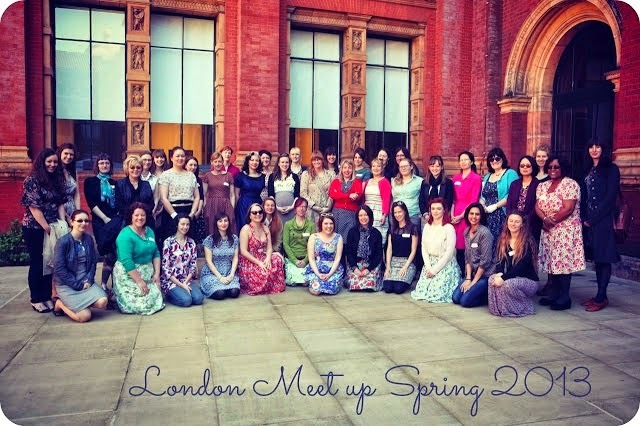 The point of this quick blog post is to let you know, if you don't already, of some seriously HOT sewing events coming up in our future. First up, is the big meet-up this weekend. Organised by the goddess that is Rachel, #NYLON14 will kick off at the V&A on Saturday morning, finishing with some fabric shopping on Goldhawk Road. Kidding, it will finish with cocktails! You can find out more about this over at Rachel's blog. I'll be there for sure - without the meet-up last year I would not have found the marvellous women (above) who now make up The Spoolettes. Next, my lovely friend Jennifer from Brooklyn, yes BROOKLYN, will be teaching at The Village Haberdashery next Wednesday. Jennifer runs the Workroom Social in New York and is over here for #NYLON14. I can't wait to polish off some drinks with her and give her the Royal treatment at Chez Szabo - actually that sounds a bit dodgy, don't panic Jennifer, you will make it out of Greenwich alive. If you've ever thought, I like this dress but I need a pocket for all my bits and bobs, I just want to stand here and look super cool, then this masterclass is for you! Jennifer will give you an overview of in-seam and patch pockets and their various applications, teach you pattern drafting methods for creating your pockets, installation methods for both in-seam and patch pockets and sewing methods to increase speed and accuracy. Check out the class information and how to register here. Here's Jennifer on the right with me and Sonja. 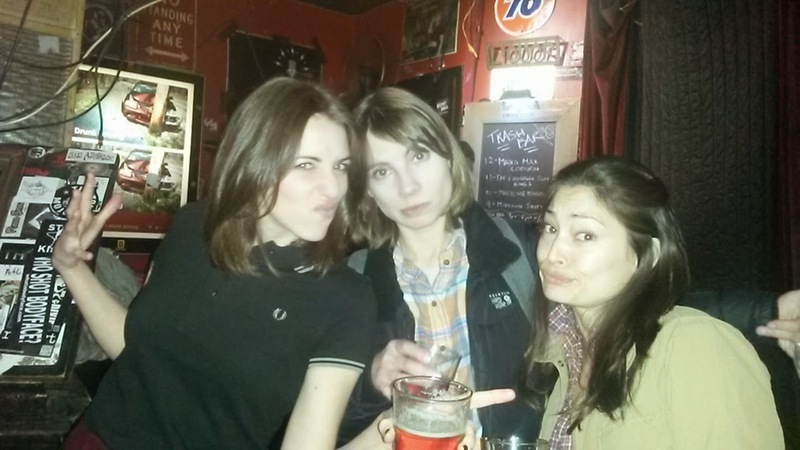 Oh take me back to the Trash Bar! And, to get your sewing buds bouncing even more, we're all off to the Minerva Crafts Meet-up next month on the 14th June. Minerva have organised a sewing weekend full of workshops, networking, guest speakers, Q&As plus all the lovely Minerva Sewing Bloggers. I cannot wait for this weekend - take a look at the details and come meet us all for a chinwag and a drink or two! Who knows, maybe Patrick will be there all starched, smelling of mahogany and Old Spice. We can but dream. So, get out of your sewing room, dust down your best dress (or troosers!) and come say hello.